Earn up to 31,192 reward points. The magnificent warmth of maple in a big-bodied 12-string with top-notch electronics. For a while maple might have been a bit misrepresented in the acoustic world, developing a reputation for being too bright for some, and lacking the richer character of other classic tonewoods. But historically, maple has actually been one of the classic tonewoods for other stringed instruments in the violin family. Taylor has revoiced its maple 600s, like this 600 Series 656ce Grand Symphony 12-String Acoustic-Electric, to re-introduce its true voice to guitar players, and the results have been amazing. If you have preconceptions about maple, check them at the door, because these guitars deliver plenty of the warmth, depth, richness and sustain your ears crave in an acoustic guitar, without losing the clarity and transparency that allows maple to reflect the player and fit into a mix with other instruments. Building remarkable 12-strings is part of Taylor's heritage. Their ease-of-play, neck stability, intonation and overall tone has made them some of the most popular 12-strings on the market. The Taylor Neck system allows precise and low action, resulting in the most comfortable "handfeel" possible in a 12-string guitar. The 656ce Grand Symphony 12-String Acoustic-Electric ships in a deluxe hardshell case for optimum fit and protection. Traditionally known for having a focused tone with a fast note decay that cuts through a mix, Taylor's maple (back and sides) guitars have been voiced to produce greater warmth, complexity, volume, sustain and responsiveness, while retaining maple’s naturally clear, linear qualities. The clarity of the high end is still there, but the bottom end has been extended. The result is a more multi-dimensional sound that gives players the kind of musical versatility of other classic tonewoods, making Taylor's maple models a compelling choice as a primary guitar, not just a stage guitar. 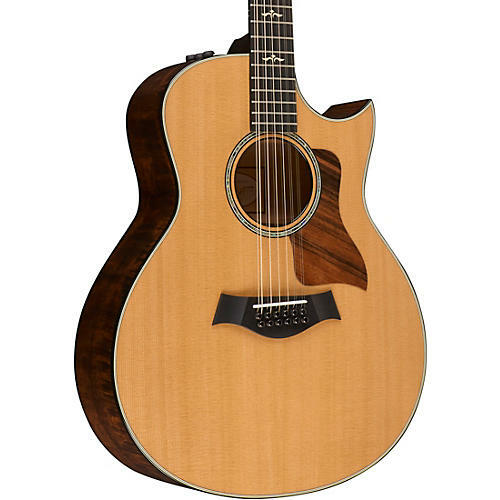 Taylor's maple guitars are voiced to be very reflective of the player’s technique, so a player with a dynamic playing style or someone who likes to vary their picking attack will appreciate how easily those playing nuances come through in the tonal response. To take home this terrific Taylor, order now.